The Dragon Tarot, by nature, is a specialty deck. It will appeal to those of us who find dragons and dragon lore appealing. You won't find traditional visual symbolism here - but you will experience a deck that is artistically well thought out and well presented, and eminently "usable". Donaldson introduces dragons as ancient symbols of knowledge and power - in virtually every culture of the world. The very word "dragon" comes from the Greek word Drakoni, which means "the seeing one". In The Dragon Tarot, Donaldson calls on dragon legends from around the world to present a saga of myth and magic. There is a very interesting section called "Dragonland - A Traveler's Report" , in which the reader is allowed to experience the adventure and magic associated with dragon energy. In "Your Journey", Donaldson presents techniques that allow the reader to access their imaginations. In "Mastering The Tarot", he shows the reader how the cards come together to tell their story. Dragon myths run the gamut of experience - from those encompassing greed, lust and the dark side of our personalities to (primarily from the Middle East) to those symbolizing wealth, power and supremacy (primarily from China). Some of my best "growing up" memories are of watching the Dragon winding it's way down the street at parade time. It was fascinating, exciting, colorful - a whole other "world"! The Dragon also has its place in astrology, which is not something that I was aware of. The Dragon's Head (also called the North Node) represents the karmic lessons that we are to learn in this lifetime. How much more important can anything get - this defines what each lifetime is! Each Major Arcana card is presented with a black and white scan, a description of the card, and section where the card "speaks" about the archetypal energy that it represents, the divinatory meaning of the card (in the upright position only), and a short discussion of additional symbols that have been placed on the card. 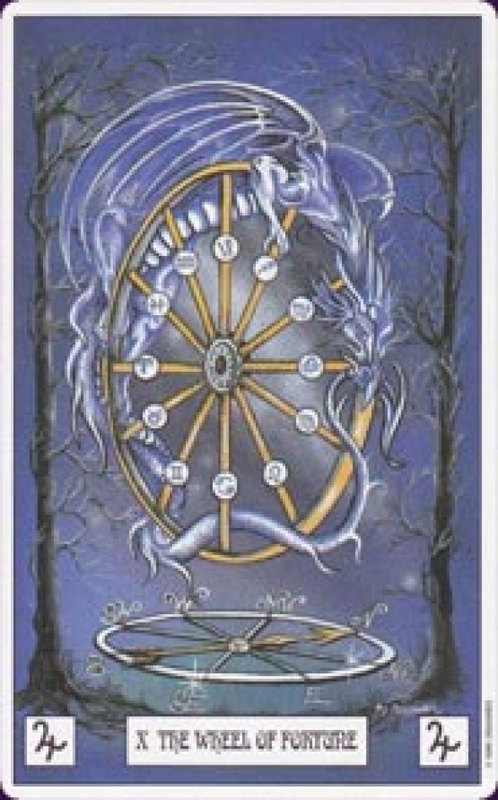 Each Pip is presented with a black and white scan, a sentence on what the Dragon guide in the card is trying to accomplish and the divinatory meaning. Each Court Card is presented with a black and white scan, a description of the energy of the card and the divinatory meaning. There is also a short addendum to the court cards, with the admonishment that while the court cards represent either male or female energy, that this energy exists in both males and females - each of us carries dual energy. While Donaldson does not present reversed meanings, he does indicate that they are a question mark that needs to be paid attention to - that the energy of the card is in some way not working as it should. In the section on spreads, the Celtic Cross is presented, along with two separate readings that are left to the reader to interpret along the lines of key questions that Donaldson presents. Donaldson has done something quite interesting with the three card spread - he has presented several different possible questions dealing with different life situations (relationship, home, career, life path, children's education and life path). There is also the beginning of a work sheet that show the reader how to bring the cards together in story form. The cards themselves are on good quality, glossy card stock. At 2 3/4" by 4 1/4",the cards are easily worked with by those like me that have small hands - a definite plus! The backs of the cards have a 1/4" white border, with an inset background of deep purple. A light blue and white dragon is placed in each of the four corners of the inset - the four dragon tails are interwoven in the center. Behind the dragons there is a diamond-like schematic outlined in fine gold lines. The cards read the same upright and reversed, so there would be no way to tell which position the cards were in before they were turned over. The majors are a combination of dragons and traditional symbols. They have a 1/4 " white border, with the number and title of the card in black lettering against white across the bottom of the card. On either side of the title is placed a glyph of the astrological sign associated with each card. The only title change is that the Hanged Man becomes the Hanging Dragon. The pips have the same 1/4" white border, with the name and number of the card across the bottom. The pips are not illustrated in the traditional manner - they contain a dragon "guide" and the symbols representing their respective suits. On either side of the title are glyphs representing the element of the respective suit. Some of the cards in this deck are fairly true to traditional Tarot, and some are very different. The traditional cards for me were the Tower, which is represented by a Tower, lightening, water and fire; the Moon, which shows a full moon in a night sky, overlooking two pillars - one on either side of a flowing stream, with a dragon between them; Justice, which shows a dragon head between the two pillars of justice, holding a set of scales in his mouth over a globe of the world and the Wheel of Fortune, which is depicted as a wheel with twelve spokes, each containing a glyph of one of the signs of the zodiac. Perhaps the most traditional card is the Three of Swords, which is seen as three swords piercing a heart. A card that I found beyond traditional, but very well done, was the Sun. Here we see dragon wings surrounding a lion face, around which are placed glyphs of the twelve signs of the zodiac, with flames surrounding them. In the mouth of the dragon we see the Yin/Yang symbol. Strength also falls into the "same but different" category. The top of the card shows a night sky, the bottom of the card shows green hills in daylight. The middle of the card shows a lion and a dragon on either side of a caduceus, which has fiery flames at its top. It appears that the lion and the dragon are having a wonderful time playing together! Donaldson ends the book with a section on dragon myths from around the world - ancient Egypt, ancient Greece, North America and Mexico, China, Japan and the West. The Dragon Tarot opens up the imagination, just as the author intended it to. While not for all people, and definitely not for beginners, I found it interesting and believe that it has a place in the Tarot world.